We are a well-established commercial landscape maintenance business in the San Francisco Bay Area. From caring for thousands of young trees that have been planted in newly emerged neighborhoods of South Beach and Mission Bay, on the eastern edge of San Francisco, to establishing healthy urban forests on lands that only 20 years ago were abandoned industrial wastelands (in partnership with non-profit organizations, city/state agencies and private businesses), we have learned how to care for young trees in extreme, urban conditions. And, in the process, have developed an unparalleled expertise in this area. These new neighborhoods, along with the financial district of San Francisco, (another area where we do much of our work,) share the same microclimate and growing conditions: manmade land (reclaimed from the San Francisco Bay) and strong afternoon winds. Both of these conditions make it tough for a young tree to establish itself. We have witnessed time and time again how installing contractors don’t have the bandwidth to properly adjust staking straps on newly planted trees: the task is difficult, time consuming, and expensive. As maintenance contractors, we see the results of this neglect. The damage is severe, the fatality rate is high, and the costs are extreme. Thus, we were compelled to come up with a complete, inexpensive solution to this challenge – a solution that would result in healthy trees, happy installing contractors and designers who have kept their projects “in the black,” and project owners who have strong, beautiful trees. This is how Green Sleeves came to be. A simple and elegant solution to a thorny and difficult problem. GREEN SLEEVES IS A CERTIFIED SAN FRANCISCO LBE (LOCAL BUSINESS ENTERPRISE) BUSINESS. 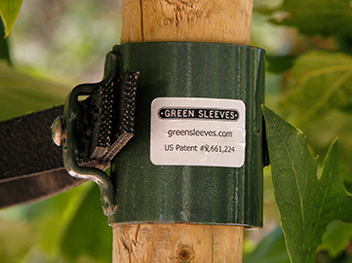 GREEN SLEEVES IS MANUFACTURED IN THE USA FROM 70% RECYCLED MATERIALS.